Growth hacking is a term that is widely used within the marketing industry, but one which can be difficult to understand. I often get asked what growth hacking actually means, and exactly how to hack growth. Before I share with you an in-depth checklist, I first want to share with you the meaning of growth hacking. We have just a few short weeks until we enter a brand new year and I want to make sure you start 2018 off the right way. I was inspired to write this piece of content about growth hacking after coming across a great infographic on Visual.ly by Click Convert Sell. This inspired me to go into more detail around growth-hacking based on my experience, and a checklist that will help you grow your business online, especially as we move into 2018. How are you going to acquire new customers? Are you offering a great first experience online? How are you retaining repeat customers? Are you making enough money to sustain and grow your business? Are you building brand advocates and generating referrals? When it comes to growth hacking, it can be a difficult and long process. To help you with this, I have created a simple yet extensive checklist based on powerful ways you can manage your businesses success. You may be doing some of the below, but think about everything I share with you. The above checklist may be quite overwhelming, but running a business is no easy feat. I now want to take you through the importance of defining your business, and target customer in this growth hacking process. I talk about this in great detail in my book; Think #Digital First, so I will just give you a brief overview of what you need to consider when defining your business and target customer. Understanding the process in which your audience will go through when purchasing a product/service. In the infographic created by Click Convert Sell, they detail 41 different “marketing weapons” as part of their checklist. I want to highlight a selection of these, and the ones that I feel are the most important. #2: Repurposing content: as you will be spending your time and money creating content, you want to get as much engagement and traffic as possible, so repurposing your content is important. #3: Guest blogging: I speak a lot about guest blogging because I have personally generated thousands of leads, and website hits from writing content on influential sites in my industry. #4: Email automation: having email automation set up based on products/services you offer is a great way to further upsell what you are offering. #7: Website pop-ups: I use a great tool called Optinmonster that allows me to create website pop-ups at different times e.g. within 30 seconds of someone landing on my website, and when someone is about to leave my website. #8: Webinars: running a webinar is a great way to position yourself as a thought leader in your industry, and gives you a great piece of content that can generate future leads. #9: Discounts and offers: I generated thousands of pounds over the Black Friday/Cyber Monday weekend because I offered a large discount on all of my products and services. It cost me next to nothing to do this, and the outcome was extremely successful. #10: Engage with influencers: during my journey to becoming an influencer in my industry, I engaged regularly with, and built relationships with experts in my industry. Measuring your success is going to be a huge part of your growth hacking strategy. Without knowing how well something is performing you won’t be able to maximise your efforts. This can be broken down into five sections. If, like me, you actively use opt-ins for email marketing purposes, this is something you must be tracking. When I use OptinMonster, I will always analyse the outcome based on visitors to that opt-in/pop-up, leads generated and click-through rate. Do you know how each product/service you offer is converting based on your marketing efforts? You need to be analysing your conversion rate so that you can optimise your strategy to get the best results. Do you have a program in place whereby you have partners or customers who talk about your business, and generate leads for you? If this is part of your business model, you should have a referral program in place to cater for this. Pirate metrics was created by Dave McClure. It is a customer-lifecycle framework that you can use to determine where you should focus on optimising your marketing funnel, to stay as time efficient as possible. If you are successful in your growth hacking, you will have a large database of customers that you want to turn into repeat customers. Think about ways you can incentivise your customers to spend more money with you. This article is not just about starting 2018 off the right way, it’s about building a business that is successful in more than five years time. One of the best ways to sustain success, is to become an influencer. This does take time. Becoming an influencer is not an overnight thing, and it does mean you have to be consistent. Here are a number of actions you can take to help you become an influencer. The final thing I want to talk to your about is automation. With the use of automation, sales will happen automatically, and because everything is setup and running without any human interference, your time can be spent elsewhere. This is something I have focused heavily on this year, and have found it to be extremely effective. The above are the four key parts of my automation, and the tools I used to help me save time. 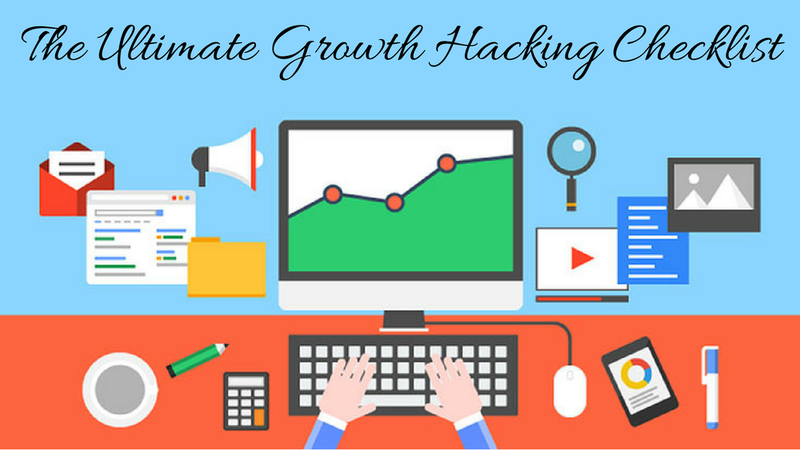 I hope that this article on the ultimate growth hacking checklist will help you start 2018 off the right way, and build your business online! If you want to get more active with your digital marketing, why not sign up to join my 30-day Digital Marketing Challenge beginning on the 1st Jan, 2018. It’s completely free of charge, and can be done so below!